Do DIYs count or does it have to be ''normal' perms and/or calendar events. I'm aiming for a 1st SR next year including BC and BCM, together with some perms ridden from home. I have a DIY 200 and 300 in mind both over 75% welsh. Alternatively the Cambrian 2B and 3A would fit the bill although riding from home would add 30+K each. I understand that the SR Cymru criteria are that of a "normal" SR in terms of DIYs; and therefore they do qualify. Is there an equivalent SR Ecosse? It was mentioned in Arrivee last year, for an SR series from events starting in Scotland. Claims to Lucy McTaggart. I don't know if there's any badge or anything available. Yes, I think that's right - though I guess Ross would have to see the route/controls for DIYs and decide on a ride-by-ride basis. 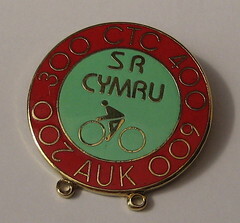 Ross has confirmed that my rides count (Cambrian 200, Brevet Cymru, Bryan Chapman and Irish Mail) so I just have to wait for the badge. Top effort. An enviable list of rides to boot! No. Doesn't quite qualify on altitude either. You'll just have to do the BC and Irish Mail 400s. Can you get it with a DIY? Will probably ride BCM as a DIY over next month. I don't know - you'll have to ask Ross to find out. Ross, can you get it with a DIY? I've got into the habit of doing the Cambrian series of permanents every year. For example, this year I'm doing one of the 600s as a August bank holiday jaunt and might squeeze in a couple of the 200s in September/October. The roads in Wales are so easy to navigate that I find these permanents very convenient (given you can start anywhere on route, although I tend to focus on Abergavenny, Hay or Chepstow) and a good alternative to the sporadic Welsh calendar events (particularly for 300s). They are the same as the SR with which you will be familiar and DIYs therefore qualify. U.N Dulates 1000k ride next year? If we've done more than one SR Cymru, do we just get a bar to on the ribbon? The Clwydian 200 out of Corwen? One of Graham Mills's rides, resurrected in March of this year by Dave Matthews. I bet The Cambrian's right on the 75% rule too! Don't think so - it crosses into Wales before Presteigne, so about 90% is Welsh. Presteigne is right on the border, so depending on how you arrive there - Danial might have a good point. On another point, I seem to remember (an amusing debate) on another long distance cycling forum. It sprang from the premise that Welsh SRs could only truly exist if the event started in Wales and was organised by someone that was Welsh. If the route is still the same as when I rode it in 2007, I reckon that rather more than 50% of it is in the BRITONS' England! Ah. I wonder if Danial's talking about the Cambrian 200 or the Cambrian 600? If the former, then 90% distance (and probably 99% altitude) is definitely Welsh. If the 600 then I dunno. I couldn't understand Danial's comment! Does he mean that the Welsh section content of the Cambrian route (or ascent) is 'exactly' 75 %, that the Cambrian is 'correctly' complying with the 75% rule or that the Cambrian section is very close but not a qualifying route? For that matter, which 'Cambrian' ride are we discussing? If we exclude the Permanents, then I am aware of three Cambrian rides! Whatever, the scheduled Cambrian 200 qualifies as a SR Cymru ride as far as I can make out.